If there was only one brand that I could live with for the rest of my life (omg how sad would that be?) I would choose Clarins. Hands down! Between their kick-a*s sunless tanners, sunscreen, moisturizer, the BEST concealer, iconic lipstick, serum, and everything in between (I highlighted them in 2015 as my favourite brand!) I could do my entire skincare routine and makeup using their products exclusively. Not only that, I would love each and every step of the way. I have to admit that Clarins skincare wasn't the first to really pull me in, mainly due to the packaging and promises that always geared to an older age group. I'm in my mid-20s and have been taking very good care of my skin for the last 10 years. The first product I bought from Clarins was their iconic Beauty Flash Balm, which can be used as a makeup primer or super-hydrating mask. I feel like I've come full circle now with their new range of vegan-friendly products, targeting young skin that stays up late, exercises often, and cares about ingredients more than anything else. Let's see what it's all about. My Clarins is a range of "new generation" skincare products that are all under $30. They focus on delivering the best that nature has to offer, in order to achieve healthy-looking skin. 9 day/night products in the collection will hydrate, balance and enhance all skin types, day after day, really. What’s inside? Fruits, floral waters and plant extracts with energizing and detoxifying super powers. Upon contact with dry skin, the glacier blue texture of this gel begins to break down traces of make-up, pollutants and dead skin cells. Rich in 91% natural ingredients, this cleanser transforms into a fine, lightweight lather. Meadowsweet extract helps purify the skin and orange flower water softens. Blocked pores, shiny skin and matte skin are reduced day after day. Rebalanced, the skin breathes again. Healthier, more pure, clear, perfectly clean. This cleanser reminds me of the Glossier milky-jelly cleanser for its no-fuss claims and effective results. There appears to be a fine shimmer running throughout, but there's no unnecessary fragrance or foam while using. I do find that the bottle squirts out a bit too much at times, so be careful when you squeeze. This is a fabulous all-in-one product to remove makeup and cleanse, especially for the price. Like a shower of finely floral scented mist, this formula prepares, refreshes and infuses the skin with beauty. Containing 90% natural ingredients, this spray toner works especially well to prep the skin before serum and moisturizer (after cleansing). It comes in a gorgeous, sturdy glass bottle and has such a fine, delicate mist. The natural fragrance is truly delightful, I can't wait to keep this toner in the fridge during the summer to refresh over my makeup on hot days. You could also keep this in your makeup kit for plumping up dry skin! It's a very multi-purpose item with many benefits. This wonderfully fresh energizing cream-gel texture boosts skin’s hydration. 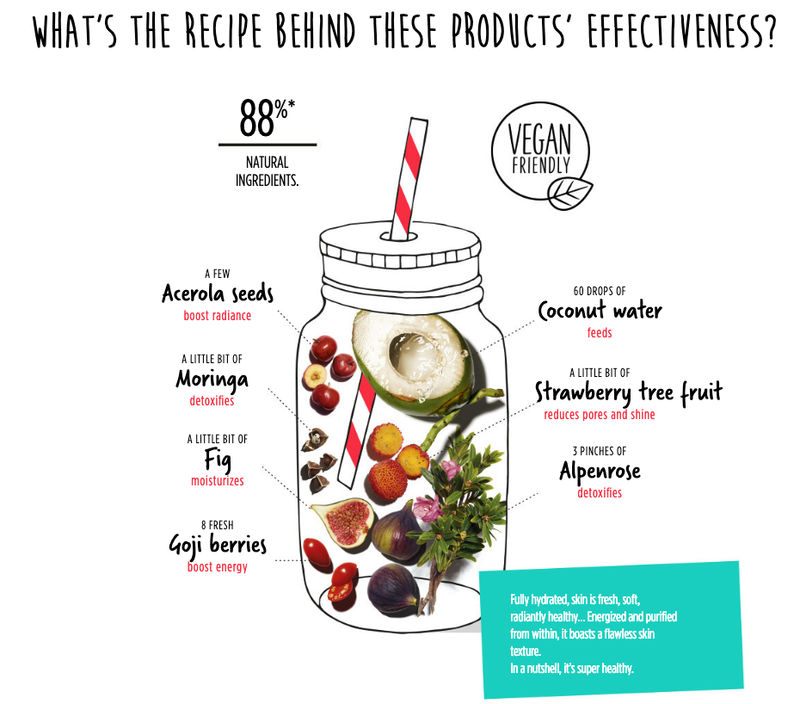 Inside, 89% of the ingredients it contains are naturally sourced, and only good stuff if you please! Its ‘pretty skin’ radiance-boosting action lasts all day: skin appears more rosy, signs of fatigue are but a bad dream. Protected, skin is energized and looks radiant, the complexion is fresh and the skin’s surface texture refined… from the moment you wake up until you go to sleep. Geared towards normal skin, this plumping moisturizer is zingy and fresh, great for waking you up. I like the gel texture, and found it to be good for my combo skin. Right now I am leaning more towards oily moisturizers in the morning, simply because I'm dealing with some dryness from my new retinol treatment. That being said, there are two other daytime moisturizers in the line - one for dry skin, and a mattifying one for oily skin. Lightweight and very fresh, this night mask is like a meditation session for your skin. It helps your skin ‘unplug’ so that it can better recuperate. The formula contains 93% natural ingredients and its soothing fragrance relaxes the skin and promotes a sensation of being ready for sleep. Moisture reservoirs are replenished, and microcirculation starts back up again. Smooth, fresh, supple soft and plumped, your skin will wake up prettier. Those who are most committed will apply the mask every night. Those who are a little less disciplined will use the mask once or three times a week. No guilt upon waking beautifully, ever! I found that this night mask layered well over my serums and treatments (BHA, AHA, Retinol). It did not clog my pores and it felt calming and comfortable on the skin. I did notice that the gel texture can get sticky if it doesn't soak in well, so some extra face massage might be necessary to distribute thoroughly. This is a better version of the Laneige Sleeping Mask, in my opinion! Far less fragrant too. Got teens, oily skin or acne? Two items I haven't tried yet are the My Clarins PORE-LESS blur and matte stick, and the CLEAR-OUT blemish treatment which targets pimples ($21 ea). Working to soothe, heal and clear breakouts, these products rely heavily on the amazing powers of natural plant extracts to be gentle on delicate skin, without excess drying or irritation. I adore the cute packaging, simple claims and delicious textures of this new My Clarins collection. Be sure to stop by their counter at The Bay for some samples, or buy online to dive right in!